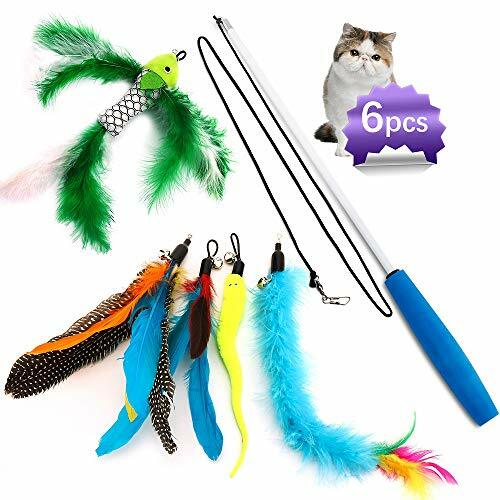 - 1 PCS high quality telescopic wand + 5PCS different feathers, different feathers can bring different freshness to the cat. Cats love birds and birds have feathers! The natural feather dangler imitates a cat's natural prey and will bring out the most instinctive reactions in almost any cat! Watch your cat jump and pounce like a fully grown tiger! Get your kitty moving with this exciting wand toy that sends feathers flying through the air for her amusement. - Playing with your cat can enhance the relationship with the cat. Bring you closer together. It will be the memorable time that playing with them!! - Great for keeping your kittens busy or bring out the most fun when you want to bond and exercise with them. The Funny interactive cat toys set will create more fun for cats. Your cat will have fun in chewing, chasing and scratching. Give your cat a way to release his energy with this combo pack of entertaining toys. Bring out your furry friend's natural instinct to hunt, keeping them happy, and healthy. - All cat toys are made with pet-safe materials and is the perfect playtime starter set for cats of all ages. Best gift for your cats!! We have a storage bag.This cat wand can be given as a gift to your cat or a friend who has a cat! !